Home Builders in Atlanta GA Might Want Our Help! Your foundation is the footprint of your home. Everything in your home depends on your foundation being perfect, and if it is, you can count on your home always being the safe place you expect it to be. With our help, home builders in Atlanta GA can have the extra help they need from the most professional team in the area to make sure you get that perfect foundation the first time. We can assist with the installation of helical piers or other underpinning products that can help the stability of your foundation of your new construction, especially if you are building on soils that aren’t completely stable. We can help the builder determine if this type of piering is needed. We also offer shoring solutions. This can add stability to your foundation as the building process is being completed. This can prevent collapse during the building process. For commercial new construction we can work with the building architect to insure your building has all the support that is needed. Did you know that a crew with a skid loader or Mini-Excavator can place up to 50 anchors in less than one day? We can keep time spent low which can help keep your dollars spent low. What builder or building owner doesn’t want to hear that? Builders aren’t always experts on foundations. Atlas Piers of Atlanta is the Atlanta expert on this subject matter. That is why it is just logical to have your builder team up with us to make sure you get the very best foundation for your commercial and residential building projects. 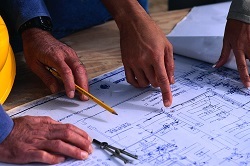 Our engineers can work with the builders to make sure the design and implementation goes smoothly. We only hire people that are the best to work with. You can be sure that it will be a symbiotic relationship with your builder. So make sure you have all your bases covered on your next building project from the foundation up!